Portsoy’s Sail Loft Bunkhouse. Review and photographs by Duncan Harley. When newspaper columnist Cuthbert Graham wrote about Portsoy, way back in 1963, he commented that the town was one of the most progressive communities on the Moray Firth. In his travel column, This is My Country, he wrote about the “triumphant success” of the town’s efforts to encourage tourism. He was quite correct and the town, nowadays a bustling coastal resort and popular stopover on the 6200km-long North Sea Cycle Route, has steadfastly continued to pursue a policy of encouraging community run tourist orientated enterprise. Alongside attending the hugely successful Portsoy Boat Festival visitors can take part in traditional music and dance workshops at the Salmon Bothy and boatbuilding courses at the Boatshed. Tourism in the town received a welcome extra boost when film makers chose Portsoy as a location for the recent remake of the Ealing comedy Whisky Galore. Alongside leads Eddie Izzard and Gregor Fisher, many locals appear as extras in the film and at the recent Portsoy Premiere, held in the loft-space of the Salmon Bothy, film-goers were encouraged to get into the spirit of the performance and dip into some whisky-flavoured ice cream. Publicists had, after all, promoted Portsoy’s Whisky Galore connection by nicknaming the town The Village of the Drammed! 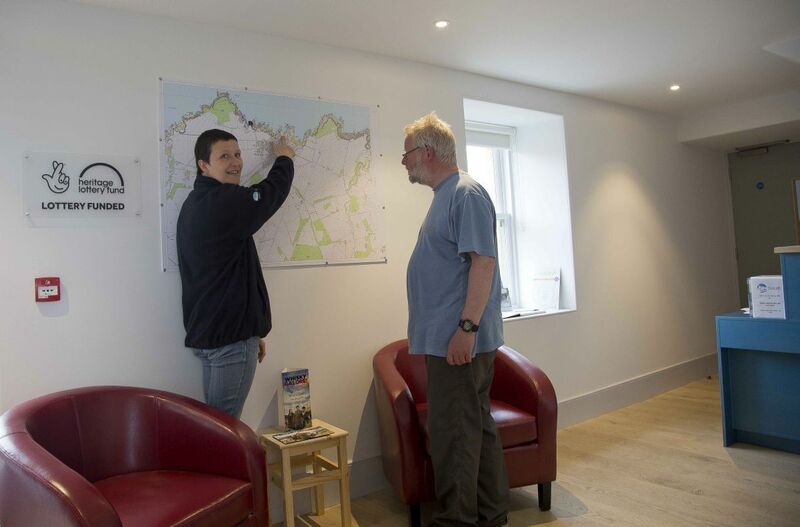 Visitor accommodation in the town received a boost this year with the opening of the newly renovated Sail Loft Bunkhouse. Situated on the Back Green near the caravan park, the Sail Loft has had a long and varied history. Formerly a sail making factory, the Category B listed building dates from the 18th Century and sits within a former industrial site used for the processing of flax and the manufacture of rope. When the demand for sails declined and the rope-works closed the Sail Loft buildings gradually fell into ruin. 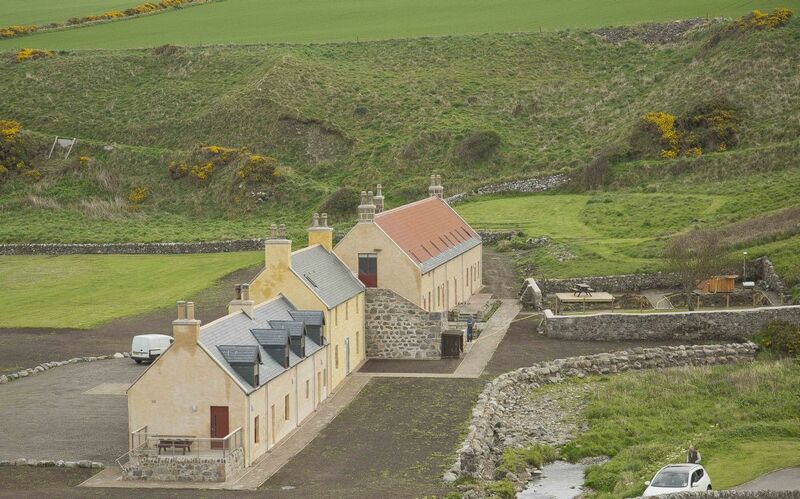 In 2006 the North East Scotland Preservation Trust acquired the property from the Seafield Estate and work began to bring the derelict structure into productive use as bunkhouse accommodation for visitors to Portsoy. After 11 years of planning and renovation, the keys to the building were formally handed over to Portsoy Community Enterprise in January 2017. Additional loan funding came via the Architectural Heritage Fund. Susan is one of a team of three involved in the day to day management of the Sail Loft and is by all accounts fully integrated into the local community. Alongside her bunkhouse duties she serves as a volunteer fire-fighter and is a keen member of the local women’s rowing group, the Portsoy Skiffettes. Another claim to fame is her role as official chauffeur to Whisky Galore star Eddie Izzard during the location shooting of the movie in Portsoy. It emerged that Eddie was due to perform at Versailles after the Whisky Galore shoot and Susan recalls that he was amazed to discover that fireplaces in the Palace of Versailles are rumoured to be faced with Portsoy Marble. 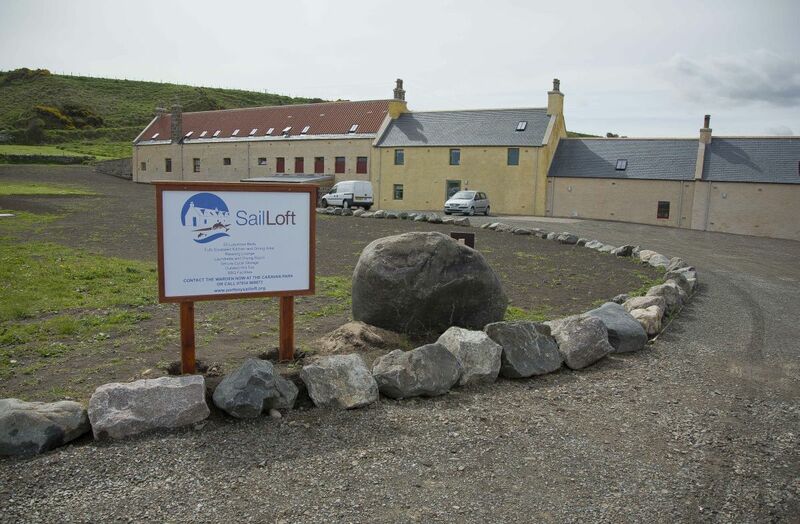 Although the Sail Loft is clearly bunkhouse in nature, the new facility offers up-market self-catering accommodation. Guest rooms are simply but pleasantly furnished with white décor throughout. Named after local landmarks, the room plan reads like a who’s who of the Portsoy coastline. Red Rock, The Pointie and The Breeks are just a few. On our visit we stayed in The Dounie. The design of the building does not allow for panoramic views of the sea but the slanted Velux windows do let in both the sound and the smells of the ocean and provide a welcome change to the typical hotel room hum of the air-conditioning unit. Those wanting to check out the view should either nip outside or, heaven forbid if you are female, check out cubicle three in the downstairs men’s showers where you can view the bay in all of its glory. Catering-wise, the open-plan kitchen and dining area is more than adequate. Two 4 ring hobs are complimented by micro-waves, kettles and an ample supply of toasters. Pots and pans, dishes and cutlery are all provided and the only onus on residents is to leave the kitchen as you might wish to find it. I was pleasantly surprised to come across an orphaned cafetiere abandoned by a previous guest and made full use of it. The Sail Loft lounge boasts a wood burning stove and is perfect for family get-togethers or business seminars. Alongside a video-projector there are lots of local books, toys and games to keep everyone entertained in the evenings. A drying room, secure cycle storage, a fully equipped laundrette and an outside wash down area for boots or bicycle cleaning complete the line-up and this VisitScotland 4 star hostel even boasts a wood fired hot-tub. On the night of our stay a group of divers were firmly ensconced in front of the roaring wood-stove planning the next days dive while a group of teachers enjoyed the warmth of the outdoor hot-tub. All in all this new facility ticks the boxes although it would have been nice to have the option of sitting behind glass while taking in the sea view. But, as I said previously, there’s always cubicle three in the men’s showers! Dr Whiteford with four of the Banff pupils who will benefit from the Project. 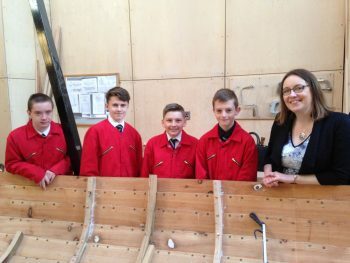 Banff & Buchan MP Eilidh Whiteford has lauded staff and organisers, following the official launch of the Chevron Boatbuilding Outreach Programme at the Portsoy Boatshed yesterday. The Chevron Outreach Project, launched today, will provide 14 to 16 year-olds with an out-of-school opportunity to develop skills in boat building. The Boatshed, part funded by Aberdeenshire Council, Portsoy’s Area Regeneration Scheme (CARS) and the European Fisheries Fund (EFF) has developed a formerly disused building on Shore Street into a purpose built facility for boat building to be enjoyed by the whole community. 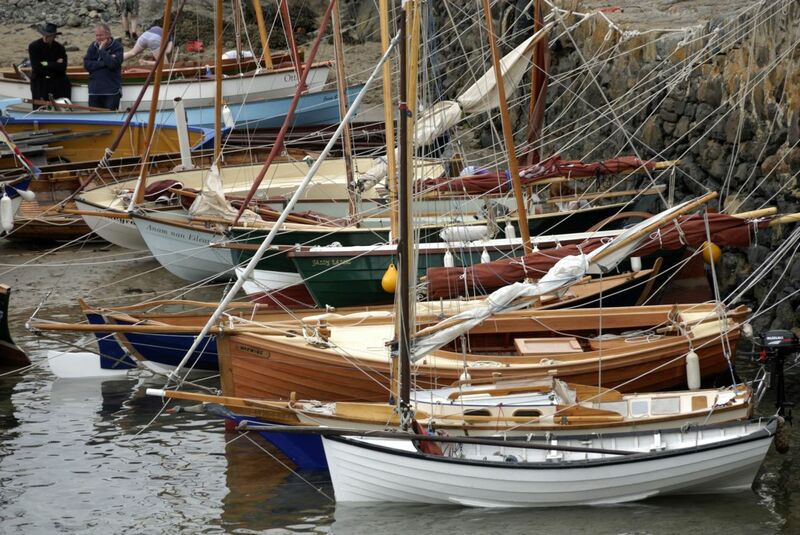 The Boatshed was opened at the 2016 Scottish Traditional Boat Festival. The Salmon Bothy, Portsoy, played host to The Hot Seats on Saturday 20 July 2013. Voice’s David Innes reviews. A warm summer evening, the Moray Firth’s chill waters lapping Portsoy’s pebble beach, a return to beautiful Banffshire, itself the final version of Paradise produced by the deity when the Garden of Eden prototype developed design faults, and The Hot Seats piloting a five-member, six-cylinder old timey hot rod in the rustic loft of the Salmon Bothy. If Carly Simon did Saturday nights rather than Carlsberg, Nobody Does It Better would be the soundtrack. Portsoy is blessed. Not only does it have two beaches, a harbour, native rock which is made into Portsoy Marble jewellery and dolphins frolicking in the bay, it is the birthplace and home town of the most talented individual ever to wear the Sacred Red in Eoin Jess. Dexys Midnight Runners’ trombonist and affa fine loon, Big Jimmy Paterson, who co-wrote many Dexys’ classics including Come On Eileen, is proud to be a native. It also houses (product placement alert) Donalds’ bakery, where the finest, crumbliest, non-homogenised oatcakes in the known universe are produced. Then the Hot Seats came visiting. The icing on the cake. Look out for it in Donalds’ window. CDs by this five-piece have whetted the appetite for a live performance. Web reviews have impressed. They have spent the best part of a week on the west coast and on Lewis having flown in from Virginia. They will again star at the Edinburgh Festival Fringe where they have won awards and critical praise. They are winning friends everywhere they go. They did not let us down. During close on two hours they sawed, bowed, flailed, strummed, struck, plucked, thimbled, picked and battered a couple of banjos, a 1952 Gibson L48 archtop, a mandolin, a fiddle and a percussion set which might have been assembled from random components in rhythm man Jake Sellers’ garage. One upright bass survived slappings from four different pairs of expert Virginian hands. 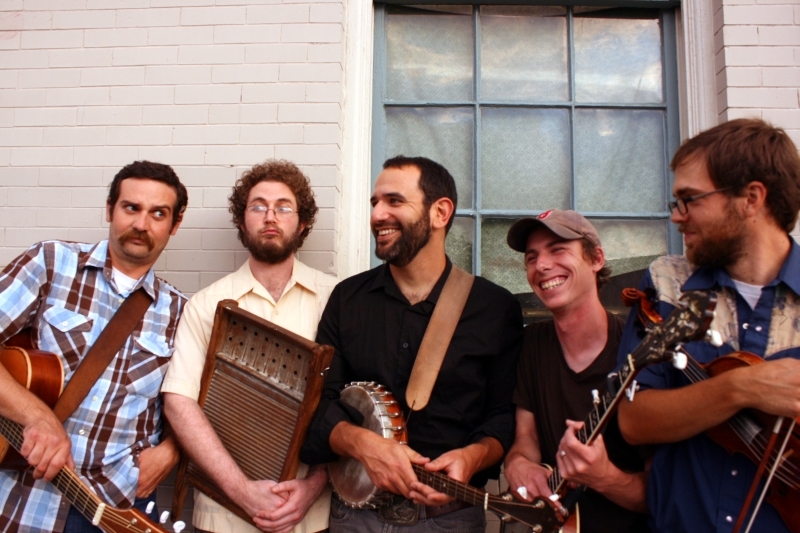 Josh Bearman, affable and gregarious, took care of the informative and deprecatory between-song banter, careful to define where each song fitted in the wide spectrum of roots Americana the Seats seized on with flair and obvious enjoyment. Between song announcements – that’ll be during the songs then – Josh’s dextrous mastery of mandolin, tenor banjo and bass was equalled by the expertise and gleeful attack of his fellow Seats. Ed Brogan, startlingly looking like the 1950s Johnny Cash, dominated centre stage, leading his own wry songs for which the Hot Seats are renowned, taking on the persona of Porter Waggoner during a couple of that giant’s ‘boozy tavern songs’ and harmonising with banjoist/bassman Ben Belcher and Bearman. Even the poor guy’s hay fever was not exempted from Bearman’s commentary, ‘Ed’s allergic to everything but mountain dew and hot dogs’. 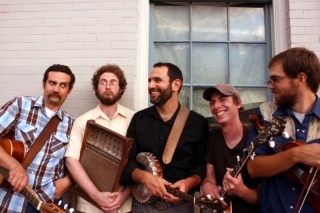 With fiddler – and bassist, of course – Graham DeZarn adding emotion, colour and rootsy seasoning to the old timey stew and the rhythmic and trebly percussion of Belcher’s 5-string banjo alternatively driving and soloing, it was often difficult to choose where to concentrate visually. Audience eyes, however, were always drawn back to Sellers, when he wasn’t taking his turn on the bull fiddle, as he alchemised rhythmic gold from washboards, cymbals, skins, skulls and thimbles. And the Seats’ three-part harmonies soared over the shore, whether they were kicking around Red Clay Ramblers’ covers, innocently intoning the naughty nudge-nudge ‘Peaches’, letting Ed loose on the mild, self-effacing mock-misogyny of ‘I Wouldn’t Take Her To A Dogfight’ or, sighing through ‘Killing Time’, confessing that touring is one long excuse to indulge in inactivity. We are fortunate to be witnessing a golden age of American old-time music, itself a folk music, described best by Josh Bearman, ‘where we take an old tune and re-purpose it’. That’s why it’s timeless. Thanks to Loudon Temple of Brookfield Knights for arranging Voice’s attendance.